I had wanted to go on another fishing trip with my boys for quite a while. Although I doubted they shared my passion, I was not sure that it could not be cultivated. It had been a couple years since I took Brian and his friends to Cave Lake and Great Basin National Park, and about five years since Tom, Doug, and I went on a tour of northeastern Nevada that included the Ruby Marshes, Illipah Reservoir, Cave Lake, Silver Creek, and Great Basin National Park. Now that they were older I thought they might appreciate the experience a little more and be better able to master the technical nuances of fishing. They seemed interested in the trip (or was it just mid-summer boredom), so we planned a mid-week trip around Doug’s days off. 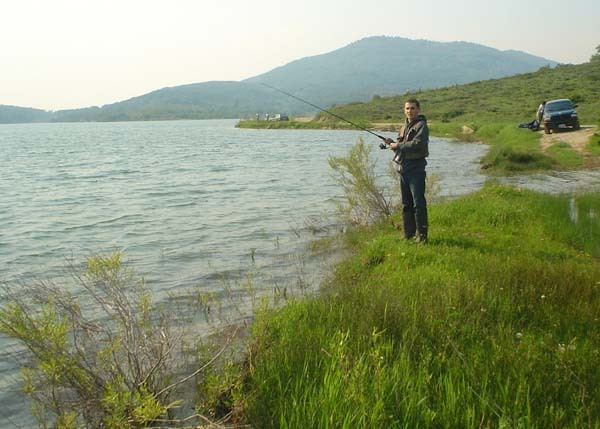 Utah Fish and Wildlife manages Kolob as a Blue Ribbon water; anglers must use artificial lures and all trout must be released except one over twenty-two inches may be kept. 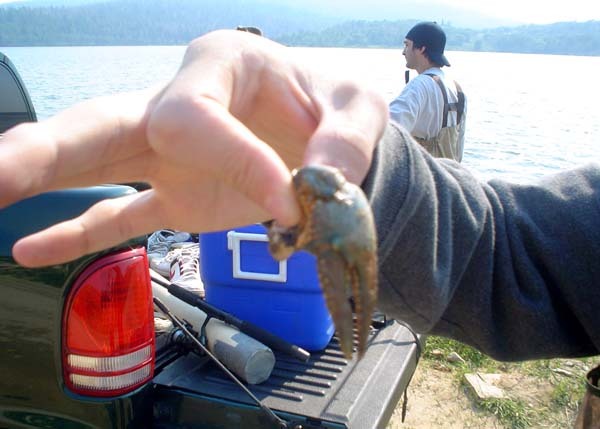 The result is larger trout (which is also fueled by large crayfish that also inhabit the reservoir). 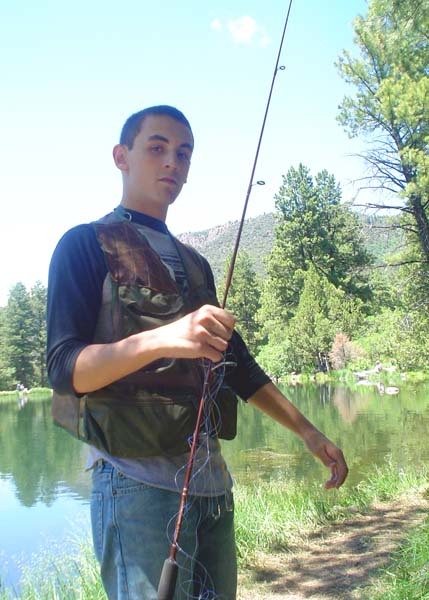 I had never fished Kolob Reservoir. Preoccupied by the lure of large trout, I mistakenly thought the boys might enjoy fishing for large trout, too. I neglected that the trade-off for catching large trout in this vast reservoir was that there are fewer of them to catch (at least it seemed that way). Nonetheless, off we went on Tuesday morning toward Kolob with fat rainbows on our mind. 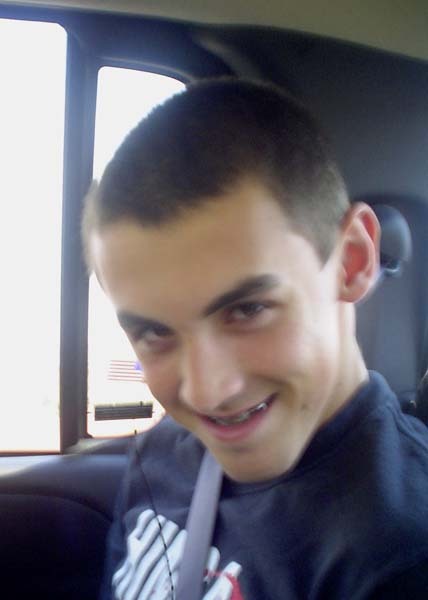 Tom was in need of driving time for his learners permit, so he drove us to St. George. 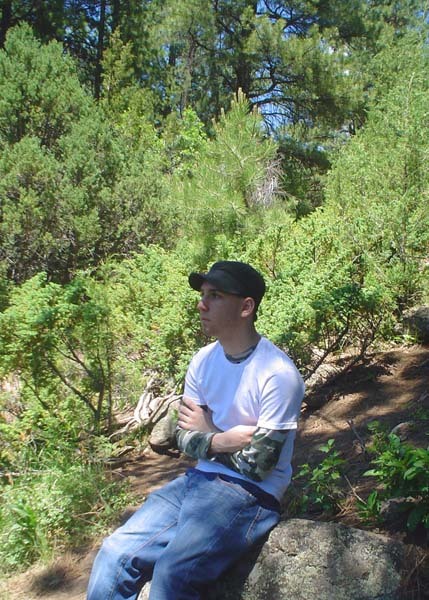 From there Doug drove us up to Kolob. There were a series of wildfires along I-15 that kept a haze over the land for over a week, and so our drive up north was blanketed in an ash-colored haze. Upon reaching St. George we could see the hot spots on the Pine Valley Mountains. We could smell the smoke in the air when we stopped for lunch. 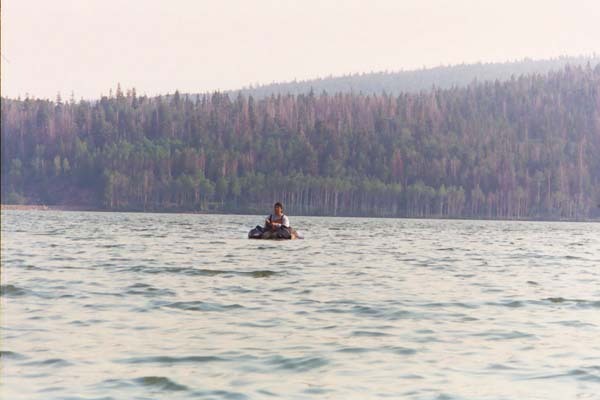 I recall hoping that the fires left the Pine Valley Reservoir area unharmed. 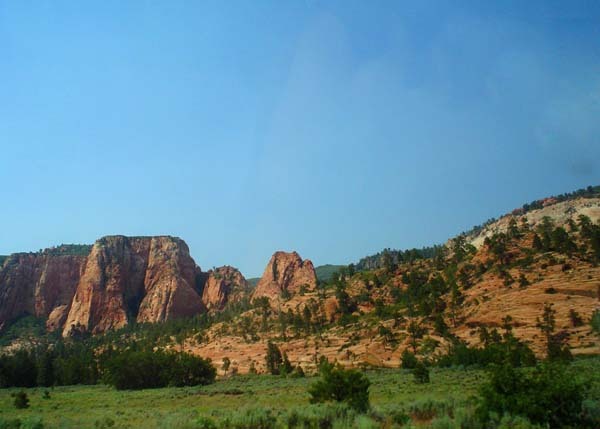 Taking Utah Highway 9 to Virgin, we proceeded up the Kolob Reservoir Road. I think Doug enjoyed driving up this long, winding road, but since he had to keep his eye on the road he missed much of the beauty. We did not stop for pictures because we had planned to return the next day, and I thought we’d stop to see more sites at that time, maybe even hike a trail. Tom took one picture of the sandstone formations, which is quite good considering it was from the moving truck. Unfortunately, we did not return the next day so the images will have to live on solely in our memories, encouraging us to return another day. There was a stiff breeze blowing towards the eastern shoreline where we launched our first fishing assault. I brought three float tubes, one each for Brian, Doug, and me. Tom said he wasn’t interested in fishing, but I brought an extra rod for him anyway. I knew from my own experience that it would take a while for Doug and Brian to get the hang of the tubes. The stiff breeze would add to the difficulty. But to my surprise, Brian declined to use a tube. I guess he was having too much fun making the “Dolphin Feesh” documentary. 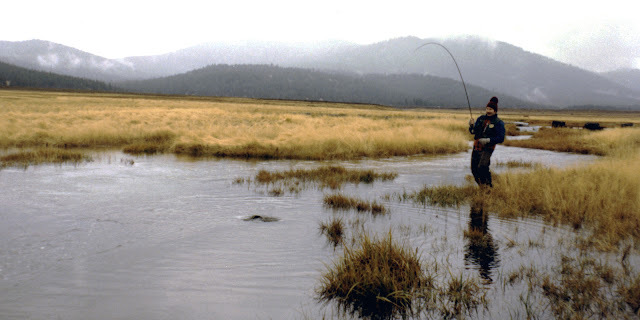 Doug wanted to try fly fishing, adding yet another layer of complexity; not only would he have to learn how to maneuver the tube so he wouldn’t be blown where he didn’t want to go, he would have to learn the physics of casting a fly rod. 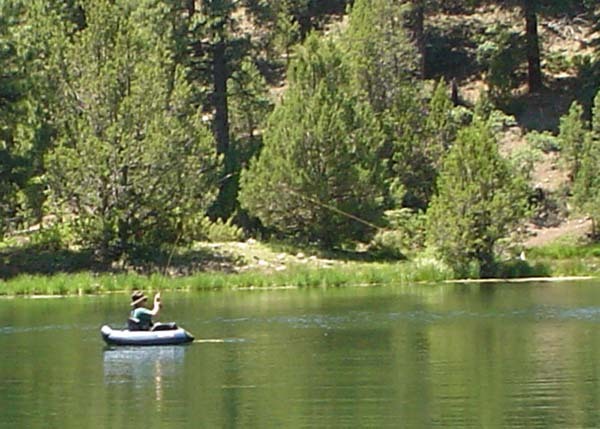 We first concentrated on the float tube: kick paddling for best propulsion with minimal water disturbance, and controlling direction by strategically employing one foot or the other. After that we tried to work on the casting. I am not the best at describing the physics of fly casting, so I fear I was not much of an instructor. I was able to teach Doug how to let out line while kick paddling; sort of a float tube version of trolling. After what seemed like a couple of hours, I had one strike that I missed and caught one five-inch rainbow… a little disappointing although, technically, not a skunking. 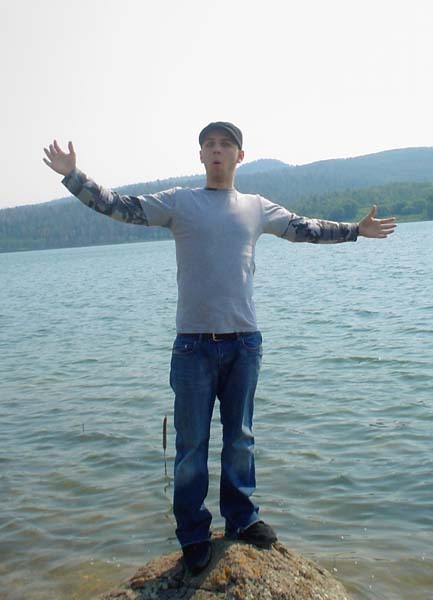 At Brian’s urging, we drove over to the western side of the reservoir, just past the Kolob Creek inlet. 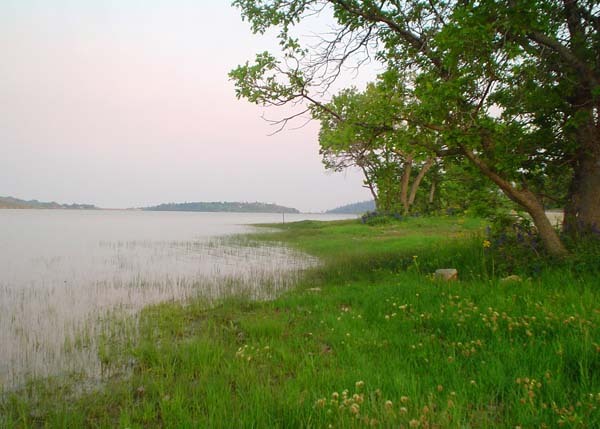 As we pulled up to a shallow shoreline, we noted large trout rolling and slurping just seventy feet off the shoreline. Doug and I quickly got into our tubes to advance on the feeding fish. These were definitely the “Dolphin Feesh” Brian said we were hunting for. Once out on the lake, huge trout, like floating pigs, continued to rise all around us. Unfortunately, I neglected to bring the floating line in the tube; so both Doug and I were stuck using sink-tips. 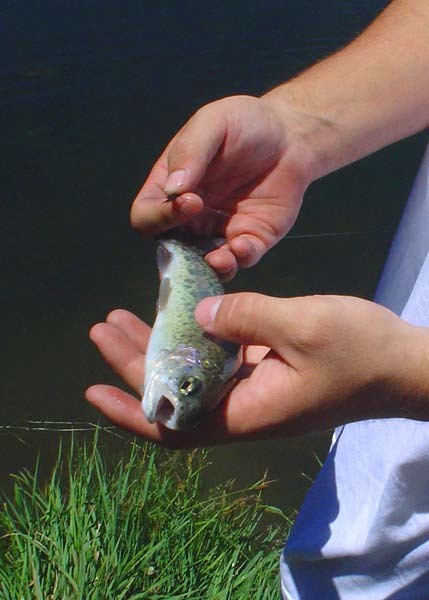 It became obvious that these fat trout were only feeding on the hatch, which looked to be CaddisKolob the next day. I can fish all day and catch nothing as long as I know there are large trout to be caught. Conversely, the boys were beginners and needed to catch lots of fish to have fun, which I completely understood. 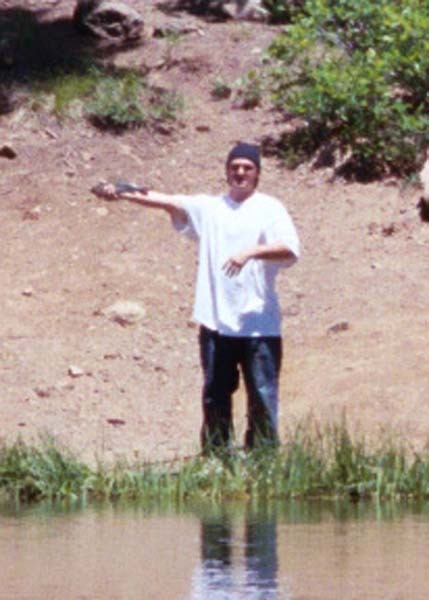 So, on the way off the Kolob Terrace we decided we needed to fish someplace else. I thought that Little Reservoir outside Beaver could be good, and with the July 4th weekend approaching I assumed, correctly, that it would have been recently stocked with lots of catchable trout. So we kept going until we reached Cedar City for a good night’s sleep. The next day Tom drove us up through Beaver and on to Little Reservoir. 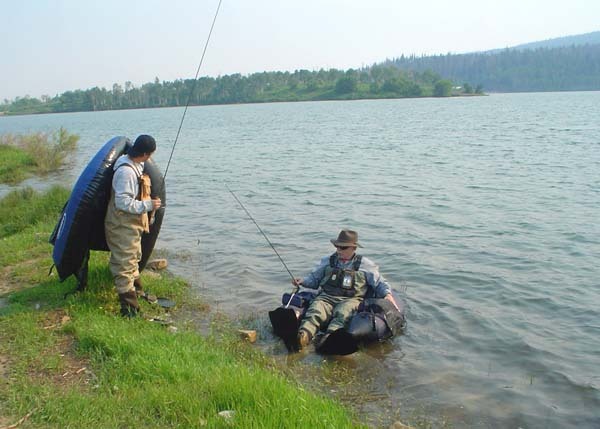 Doug decided to forgo the float tube and the fly rod, deciding to fish from the shore. I rigged up the three spinning rods for them to use, and then launched myself in the float tube. I hooked three trout in a row as soon as I got out into the middle of the lake (true, as supported by Brian’s video tape). Shortly thereafter the boys started catching trout, too. Brian and Tom caught three each, and Doug, the more serious fisherman, caught about ten. In fact, poor Doug became the official “trout releaser” as neither Tom nor Brian wanted to extract the flies from the trout mouths. As for me, I lost count, but Brian estimated I caught about twenty trout. That might have included about five that came off the hook before I brought them to hand. Nothing big, but lots of action. 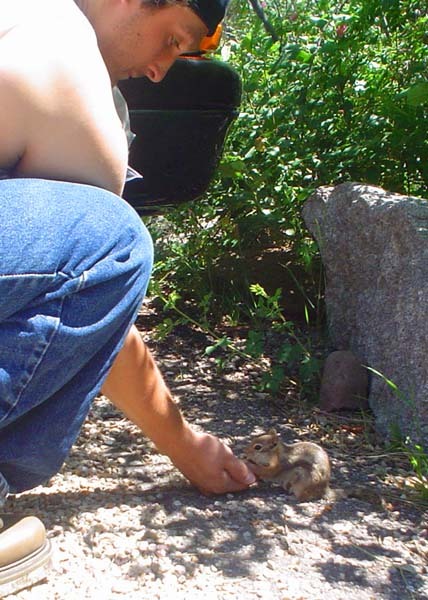 During those three and one-half hours at Little Reservoir we saw a yearling mule deer come down for a drink, a beautiful yellow-breasted finch with a red head, and several domesticated ground squirrels that readily took peanuts from the boys. All in all, I think everyone had an enjoyable afternoon. Perhaps we’ll go back in August and run up to Anderson or LaBaron Reservoirs. At that warm time of year, 9,500 feet of elevation will feel mighty fine. 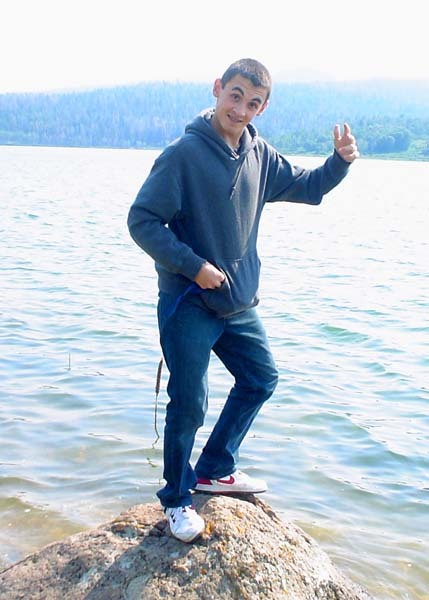 Regardless, I was happy that Little Reservoir put the Kolob memories behind us.